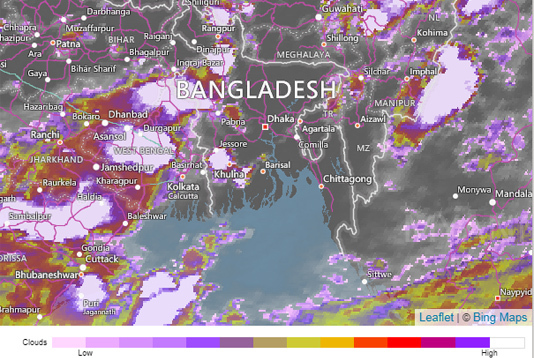 Temperature is likely to drop tomorrow as Met Office has forecasted light to moderate rainfall may occur over the country, an official of Bangladesh Meteorological Department (BMD) informed on Friday. It was unusual of sudden rise of temperature in the month of July as 39 degrees Celsius temperature were recorded yesterday at Rajarhat of Kurigram, second highest temperature of this year, he said adding, “This abnormal behaviour of weather might be linked to adverse impact of climate change, reports BSS. Mild to moderate heat wave is sweeping over Dhaka, Mymensingh, Sylhet, Rajshahi, Rangpur, Khulna and Barishal divisions and the regions of Cumilla, Noakhali, Sandwip and Sitakunda and it may abate, a Met Office weather bulletin said today. Day temperature may fall by (1-3) degree Celsius and night temperature may fall slightly over the country, it added. According to a long range weather forecast of BMD, the country may experience normal rainfall during the rainy season.